This could be your secret key to greater energy, heart and brain health. • Designed to support healthy levels of homocysteine, which could help prevent age-related brain shrinkage. BioActive B-12 is made with non-GMO ingredients and every batch is tested to ensure it meets FDA gluten-free requirements. Take this opportunity NOW to discover just how fast this essential vitamin can help you feel more energized and alert. Vitamin B-12 is crucial for energy production, a healthy nervous system, and brain health. Up to 40 percent of U.S. adults have low B-12 levels, which can lead to fatigue, low mood, and poor concentration and memory. BioActive B-12 utilizes the methylcobalamin form of B-12, which is the form most active in the body. Many supplements on the market use a cheaper form of B-12 called cyanocobalamin. This form is inactive in the body, and your body must convert it to the active form, methylcobalamin, before it can be used. 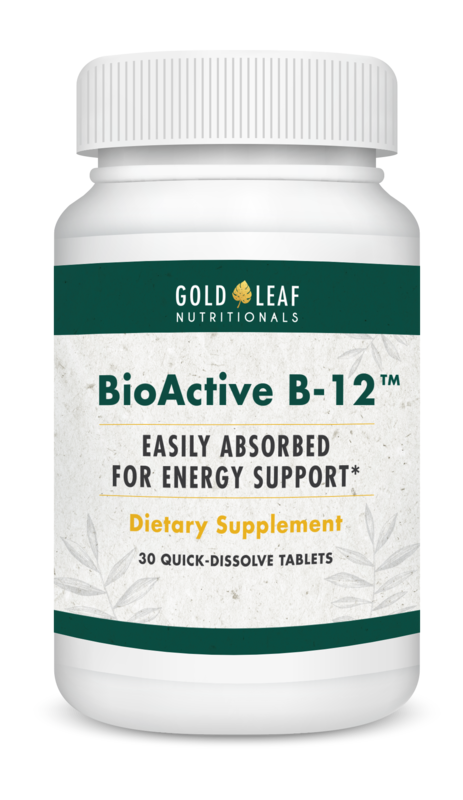 What are the quality standards Gold Leaf Nutritionals uses for their formulas, including BioActive B-12? Is there any soy or gluten in BioActive B-12? Each batch of BioActive B-12 is tested to make sure it gluten-free according to FDA regulations. BioActive B-12 does not contain any soy ingredients, though it is processed in a facility that may process soy. BioActive B-12 is made with non-GMO ingredients. Is BioActive B-12 made in the USA? All you need to do is take 1 tablet per day. You can take it with meals on an empty stomach. Just simply place the tablet under your tongue, allow it to dissolve and then swallow. If I have questions or am unsure about anything about BioActive B-12, can I speak to someone on the phone? Yes, your supply of BioActive B-12 is 100% protected by our no questions asked anytime guarantee. You have an unlimited amount of time to try it out. If at any time you’re not thrilled with your results, we’ll refund you every penny of the product price.